Make sure your infant/toddlers car seat is up to date. One of the most important jobs you have as a parent is keeping your child safe when riding in a vehicle. Each year, thousands of young children are killed or injured in car crashes. Proper use of car seats helps keep children safe. Looking at carseats for my grandchildren was overwhelming. The type of seat your child needs depends on several things, including your child's age and size and the type of vehicle you have. 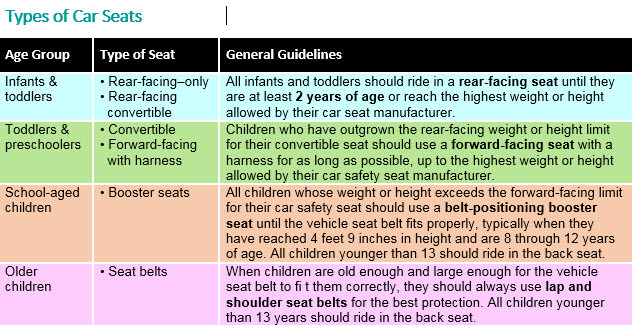 Read on for more information from the American Academy of Pediatrics (AAP) about choosing the most appropriate car seat for your child.